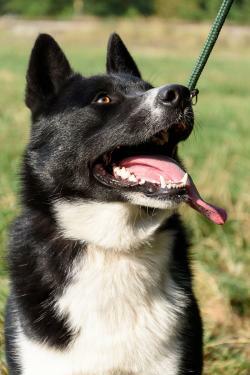 An immensely popular dog in its home country of Finland, the Karelian Bear Dog is slowly catching hold in the United States. Known for its toughness and fierce intelligence, the breed is a great choice for the right owner. 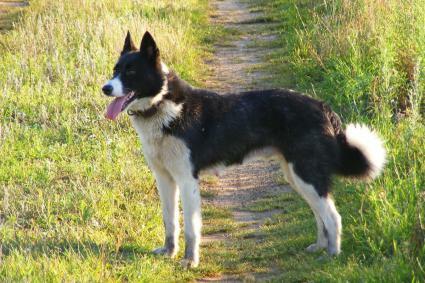 Karelian Bear Dogs originated in Finland where they are known as the Karjalankarhukoira. They were bred to help hunt and bring down all sizes of game including large species like bears, boars, wolves, elk and moose. The breed is descended from "spitz" type dogs bred by the Vikings and the most closely related breed to them today is the Russo-European Laika. The typical Karelian Bear Dog weighs between 44 and 50 pounds. They have a strong, long frame covered in thick, short fur with an undercoat. These dogs are very strong and their tail looks like the typical spitz tail, curving up and back with longer hair at the tip. The coloring is mostly black with some white on their chest, face, belly, shoulders and legs. Some dogs may have some brown shadings in the black sections of their fur and some may have more white areas than black. They shed due to their dense double coat; regular brushing will be necessary to keep the shedding to a minimum. Karelian Bear Dogs were bred to be working dogs including hunting game and guarding. They are intelligent and intense athletes with a tenacious work ethic. They are also known for a strong prey drive and for dog aggression. These dogs tend to bond very strongly with one family member. They are a very alert breed and will bark, sometimes excessively, to notify owners of anything approaching the property. Due to their aggression, Karelian Bear Dogs don't tend to do well with other dogs, especially males, and with smaller animals such as cats. While they can live with other dogs, it will require a lot of training, socialization and supervision to do so successfully. They can do well with children and are protective of their families but are territorial and wary of strangers. This means they are not a good fit for a busy household with new people coming and going. Since the breed was created to be a working dog, they have a strong need for regular exercise and would not do well in a setting where they don't get to move around and run a lot. They are extreme athletes and can easily jump over fences that would deter many other large breeds, so a tall, secure fence for your yard is a must. Karelian Bear Dogs can engage in any activity that requires an active and athletic dog. The activity they are most known for is hunting game. Since they enjoy the outdoors, they can make great hiking and camping companions. The Karelian Bear Dog has become known particularly for assisting in conservation management in the United States. The dogs are used to keep bears away from human-inhabited areas in state and national parks in Alaska, Colorado, Montana, Nevada and Washington. In fact, the dogs were first brought to the United States for this very purpose in the 1990s. Hip dysplasia is a painful condition affecting the dog's back end. Progressive retinal atrophy is a degenerative disease of the retina. Pituitary dwarfism is a malfunction of the pituitary gland that can lead to abnormal growth, hair loss, teeth problems and sterility. Since this is a fairly recent breed to the United States, there are a limited number of breeders with purebred puppies. The American Kennel Club lists breeders on their website. You can contact the Karelian Bear Dog Club of America for advice on available litters and possible older dogs available for adoption. 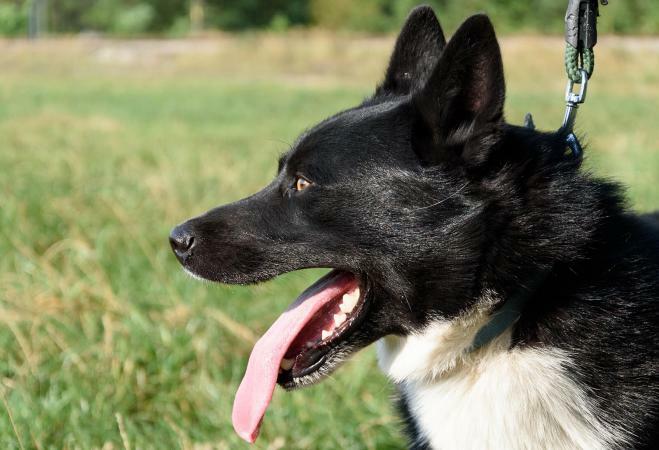 The Karelian Bear Dog is a beautiful, strong and very intelligent breed that is not for everyone. Due to their strong prey drive and tendency to be dog aggressive, they would do best with an experienced owner or one willing to put in the time, commitment and necessary resources into socializing and training their new canine companion.